Alex & Emma is a 2003 American romantic comedy directed by Rob Reiner and starring Kate Hudson and Luke Wilson. Written by Jeremy Leven, the film is about a writer who must turn out a novel in thirty days or face the wrath of loan sharks. Alex Sheldon (Luke Wilson) finds himself in a tricky situation. Locked in his creative process, he is entrapped in a disastrous economic situation: he is ruined, and he must repay a US$100,000 debt to the Cuban mafia. He is given a 30-day ultimatum to repay the money he owes them or they will kill him. And the only solution to this big problem is to finish his novel. Or rather, to start it, since he has not written one single line. But he has an idea for the story: A comedy about "the powerlessness of being in love, how love devours the insides of a person like a deadly virus". He decides to hire the services of Emma Dinsmore (Kate Hudson), a stubborn stenographer, just for her help to finish the novel, so he can receive money from the publisher in order to pay his debts. So finally comes the novel: It tells the story of Adam Shipley (Luke Wilson), a writer who has been hired to tutor the children of an attractive French woman (Sophie Marceau), who is going through bad economic times, and to whom Adam falls in love, despite the failed temptations of the au pair. 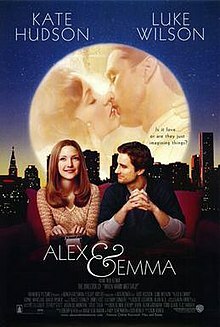 As Alex dictates his novel to Emma, the movie cuts away to scenes from the novel, where Adam (Wilson) interacts with a series of nannies (all played by Hudson), and falls for the last one. But on the other hand, Emma begins to question the ideas of Alex Sheldon, while starting to affect his life as well as his work. They soon fall for each other. Alas, after finishing the book, Emma discovers that the French woman of the history was based on a real person, a former girlfriend of Alex who just broke up with her latest boyfriend and now eats with Alex in a bar to invite him to a dance. Alex soon realizes that the person he really wants to be with is Emma. After the book was done and handed it to his publisher. He already paid off his debt. After much prodding, he gets to meet with her to write the end of the book in which Alex has changed and shows Emma he wants her to be an important part of his life. Emma was reluctant at first, but decided to finish the better ending. She loved it and Alex profess his love for her and she accepted. Developed under the working title, Loosely Based on a True Love Story, the movie is loosely based on a true love story of author Fyodor Dostoevsky, who dictated his novel, The Gambler, in 30 days in order to pay off a gambling debt—and in the process, fell in love with his young stenographer. The film was modeled after the Audrey Hepburn movie, Paris When It Sizzles. The film was widely panned by critics, with Rotten Tomatoes giving it an 11% positive rating by calling it "a dull and unfunny comedy where the leads fail to generate any sparks." Alex & Emma was a flop, grossing just over US$15 million at the box office. ^ "Alex & Emma". Box Office Mojo. Retrieved April 15, 2012. ^ "Alex & Emma". Internet Movie Database. Retrieved April 15, 2012. ^ "Full cast and crew for Alex & Emma". Internet Movie Database. Retrieved April 15, 2012. ^ "Alex & Emma". Chicago Sun-Times. 2003. Retrieved December 16, 2010. ^ "Alex & Emma". Rotten Tomatoes. Retrieved December 16, 2010.